﻿ Sonderbooks Review of Which One Doesn't Belong? Review posted April 5, 2018. Stenhouse Publishers, 2016. 36 pages. I’m reading and reviewing this book during my Newbery year even though it was written in 2016 and isn’t eligible – because it makes my mathematical heart sing! 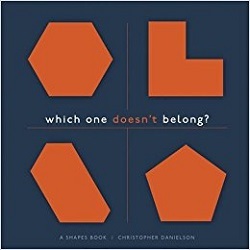 The idea comes from the old Sesame Street song – “One of these things is not like the other” – except on these pages, all four shapes can be the correct answer! On every page of this book, you can choose any shape and say that it doesn’t belong. The important thing is to have a reason why. How is your shape different from the others? What if you had picked a different shape? While the question is the same on every page, some pages are more challenging than others. You may need to put the book down to think and come back later. So when you’re ready, turn the page and decide which one doesn’t belong. It’s interesting to me that no answers are given – not even on the website. I didn’t figure out a good answer for every shape – I guess I need to keep thinking! I made this book to spark conversations, thinking, and wonder. I hope you will see similarities and differences in unexpected places. I hope this is a book you will leave open, think about, and return to. I hope you will share it with others. I hope you will send me your own sets of shapes to challenge me to say which one doesn’t belong. Sparking conversations! Encouraging critical thinking! Wow! As a former math teacher, one of my favorite things about this book is the way it teaches there is not only one right answer. And that there might be different reasons for any given answer. As far as I’m concerned, the Mathical Book Prize was well-deserved. I’m not sure when I’ve been more excited about a math book for kids. On the website, a parent talks about discussing the book with a four-year-old – and yet the puzzles aren’t boring for an adult with a master’s in math. How often can you say that about a book?